The fourth edition of the series brings me to Rijkswaterstaat, the Dutch government agency responsible for the main connecting infrastructure in the Netherlands (roads, bridges, waterways and water systems). 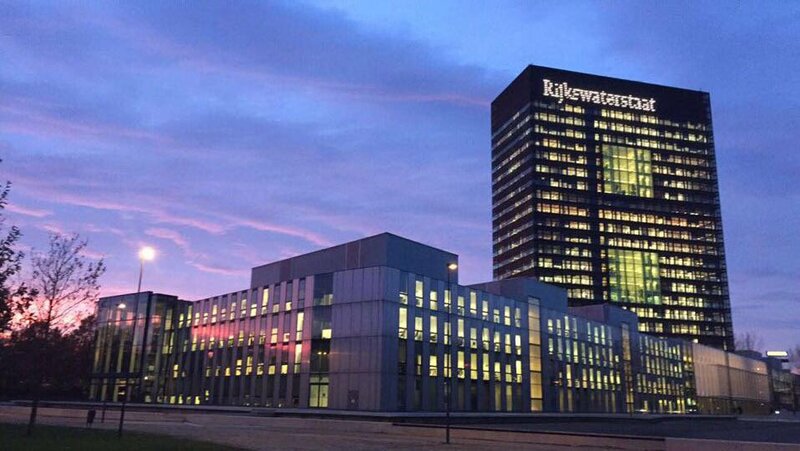 I talked with Bas van Essen who’s responsible for RWS Datalab, the big data lab within Rijkswaterstaat (RWS). RWS is an organization that manages roads, waterways and water systems. Building the infrastructure is outsourced to 3rd parties, though RWS has control over the projects and also has its own design department to safeguard the knowledge on various constructions. Approximately 14% of the total revenue is spent on IT. That number might surprise you, but there’s a pretty big and still increasing dependency on IT. Essentially, a tunnel is a data object; all moving parts in the infrastructure are data objects (bridges, waterlocks), and roads themselves are becoming data objects as well. This means that RWS is quickly making the transition to becoming a data driven organization. To that end Perry van der Weyden, RWS’s CIO, joined the organization in 2014, and he asked Bas van Essen in 2016 to build the RWS Datalab. According to the i-Strategy and i-Vision that Perry commissioned for RWS, there should be space for co-creation within RWS and with business partners to convert existing data into smart solutions to tackle the challenges of RWS now and in the future. The initial idea was to show the value of analytics to the organization with a small team doing a couple of POC like projects. What happened though is that the first few projects were so successful that after only 6 months the Lab has already grown to about 25 people and currently has over 30 projects on hand. Experimenting is only a minor part of what the team does; the focus is on implementation and business adoption of analytics projects that directly add value. The focus is on implementation and business adoption of analytics projects that directly add value. The lab invests heavily in experience and engagement to ensure the organization is on board with the innovations it delivers. RWS made the decision to power all their analytics using SAS. Of course, the data scientists in the team can use R and Python for experimenting, but whenever a deliverable is promoted to production, it has to run on the SAS platform. This strategy pays off: the analytics infrastructure RWS has put in place is of such high quality and reliability that they’re considering opening up their platform for third parties in the near future. Apart from the lab itself, which is already a cool project, the coolest one so far was monitoring vital assets for predictive maintenance. SAS Event Stream Processing was used to process the sensor data coming from water locks (‘sluizen’). Another cool project was incident predictability. A model using 35 datasets with 184 variables lead to a better risk map with the top 10 traffic incident locations. And what to think about asphalt raveling? By predicting road wear the longevity of the asphalt layer can be optimized which leads to lower costs and better roads. A concept model is already showing promising results, and RWS is now involving several PhD’s and professors to improve it. There’s also a plethora of new projects on the horizon, e.g. using text mining for crisis management (sentiment analysis on reports), and real-time analysis of traffic signs using image recognition. A model using 35 datasets with 184 variables lead to a better risk map with the top 10 traffic incident locations. The success of the lab also created a challenge: it is important to make sure the whole organization can keep up with the pace in which RWS Datalab keeps delivering new projects. Another big one is access to the multitude of disparate data sets; Bas hopes the new data lake will help making data available from one single location. A third challenge that was mentioned is keeping people on board: the data scientists in the team are highly sought after. Finally, managing all the partnerships internally, within the government and with external parties is mentioned. For RWS AI and machine learning are the biggest and most important developments within RWS Datalab. Especially deep learning is mentioned as an approach which has potentially a lot of value. There’s some controversy as well: how can the Dutch government remain transparent when algorithms are applied that are too complex to be understood by humans? The public debate about these topics hasn’t really started yet but it’s about time it does, according to Bas. Even though I was already familiar with RWS Datalab before this interview I’m impressed with the progress they’re making and the cool stuff they’re doing. No wonder they don’t have problems finding young data scientists to join the team: you can work with the latest technology, apply the most innovative algorithms, learn a lot, work in a great team and have an impact on society as well. What’s not to like?